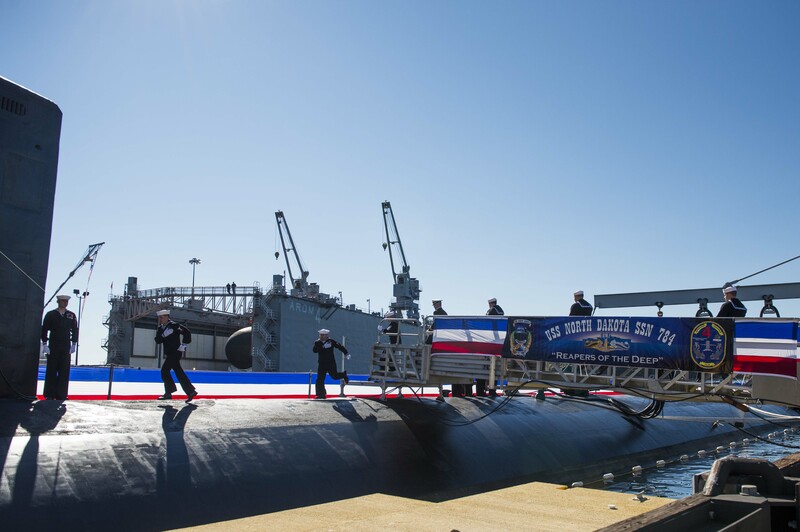 GROTON, Conn. (NNS) — USS North Dakota (SSN 784) officially became the Navy’s newest addition to the submarine force following a commissioning ceremony held Oct. 25, at Naval Submarine Base New London. Adm. Jonathan Greenert, the 30th Chief of Naval Operations, was the ceremony’s keynote speaker. He enthusiastically welcomed North Dakota to the fleet and reminded the crew of the important role they will play in protecting the nation’s security while executing his standing operating orders of: Warfighting First, Operate Forward and Be Ready. Capt. Douglas Gordon is North Dakota’s first commanding officer. He leads a crew of about 136 officers and enlisted personnel. While born in Indianapolis, Indiana, he refers to Carrollton, Georgia, as home. He enlisted in the Navy and attended Nuclear Power School prior to being released from active duty to attend Auburn University on an NROTC scholarship. Gordon graduated from Auburn University in 1991 with a Bachelor of Science in Electrical Engineering. Ironically the only native North Dakotan assigned to the submarine is the ship’s senior enlisted advisor or chief of the boat, Master Chief Electronics Technician (Submarines/Diver) Timothy Preabt. Katie Fowler, wife of retired Vice Adm. Jeffrey L. “Jeff” Fowler, a native of Bismarck, N.D., serves as the submarine’s sponsor. She broke the traditional champagne bottle against the boat’s sail during the christening ceremony in November 2013. Construction on North Dakota began March 2009; the submarine’s keel was authenticated during a ceremony on May 11, 2012; and the submarine was christened during a ceremony Nov. 2, 2013. North Dakota is the second Navy ship, and first submarine, to be named in honor of the people of “The Peace Garden State.” The other ship was the Delaware-class battleship BB-29, which was commissioned April 11, 1910 and decommissioned Nov. 22, 1923. This entry was posted in Commissionings and tagged bottle, commissioning, Fowler, navy, North Dakota, PCU, society of sponsors, SOS, sponsor, USN, USS. Bookmark the permalink.